Addressing a crowd of about 1,000 people Thursday in Portland, Donald Trump made his third campaign stop to Maine, slamming the secret delivery of $400 million to Iran on the same day the country released four U.S. prisoners back in January. "I wonder where that money really goes," he said. "In their pockets or toward terrorism? "I think it's so sad. It's so disgusting," Trump added. "Bushels and bushels of cash. And then you look at our country where we owe $20 trillion." 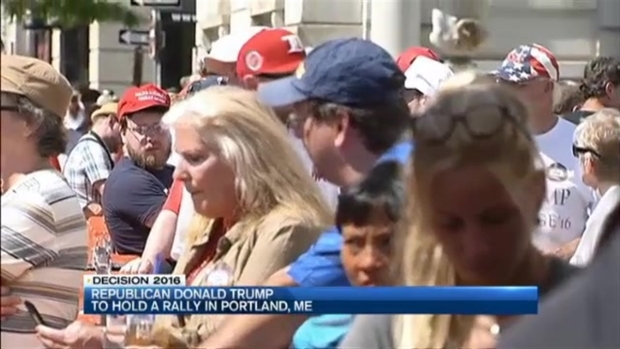 Donald Trump is paying another visit to Maine. He held rallies in Portland and Bangor this year. Secretary of State John Kerry has denied any connection between the cash delivered to Iran and the implementation of the nuclear deal and the prisoner swap that all occurred in rapid succession. He said the payment was part of a deal under the then-U.S.-backed shah to buy $400 million worth of military equipment in 1970s. News of the deal came out just this week. But Trump isn't buying Kerry's explanation. "They'll have nuclear weapons much faster because of that deal than they would have," Trump said. "And now they can buy them! "We got nothing out of this deal," he said, adding that it "sets a terrible, terrible precedent." Donald Trump's town hall in Portland, Maine, was interrupted several times by protesters; some were ejected for silently holding pocket Constitutions in an apparent nod to the gold star Khan family who asked Trump if he had ever read the document. 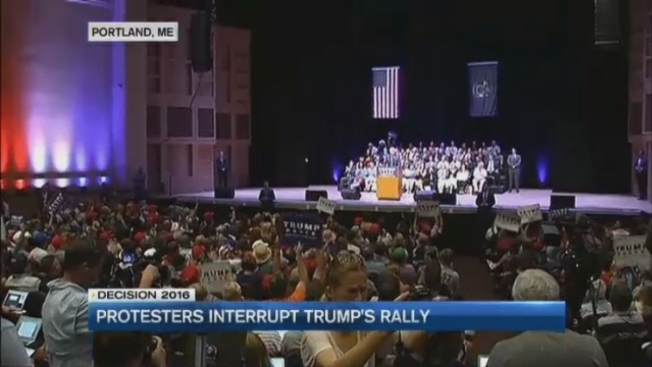 Trump was interrupted several times during the rally. A few protesters were ejected for holding up pocket-sized copies of the U.S. Constitution, a likely nod to the gold star Khan family, who spoke out against Trump at the DNC. "I sort of miss my protesters," Trump said during the event. The oldest college Republican chapter in the nation, which has supported every GOP presidential nominee in the last 128 years, denounced Trump after polling its members. More than 100 protesters gathered outside Merrill Auditorium, as well, holding up signs denouncing Trump's views on immigrants and the treatment of the Khan family. Trump also briefly addressed the controversy over his refusal to endorse House Speaker Paul Ryan, saying "Paul Ryan's a good guy." 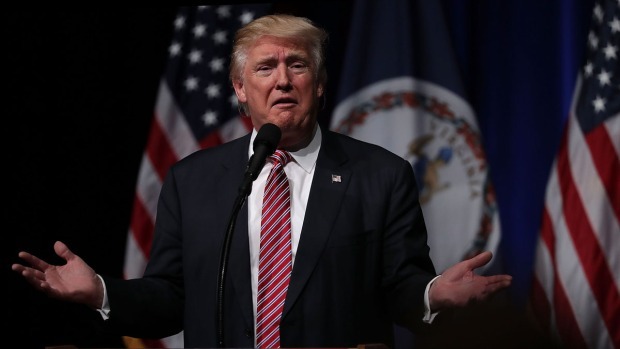 He also dismissed talk of a rift between himself and his vice presidential pick, Mike Pence. He said Pence checked with him first to make sure it was OK if he endorsed Ryan. Trump also spoke about veterans issues, violence against police, gun rights, and of course his Democratic opponent, Hillary Clinton. Reading from notes, Trump said, "The Obama-Clinton foreign policy has handed huge portions of Iraq, Libya, Syria and other areas to ISIS." He said Obama has let things get out of control, and probably regrets naming Clinton Secretary of State. "If Obama had it to do again, he would never have picked her as Secretary of State," Trump said, "because he has gotten into such trouble because of the decisions that she probably made or convinced him to make that it's ridiculous." He also continued to criticize Clinton for the ongoing email controversy. "She lost 33,000 emails - how did that happen?" Trump said. "She deleted those emails to cover up what could be a major crime. And it is actually a major crime." The New York real estate mogul is holding a town hall-style meeting Thursday afternoon at Merrill Auditorium in Portland. Introducing him was Maine Gov. Paul LePage, who referred to Clinton as the "Queen of Corruption." Trump has been a frequent visitor to Maine this year. He previously held rallies in Portland and Bangor. The presidential candidate hopes to win at least one, and maybe more, electoral votes in Maine, one of only two states to divide the votes. Maine awards one vote to the winner of each congressional district; the other two votes go to the winner of the statewide vote. 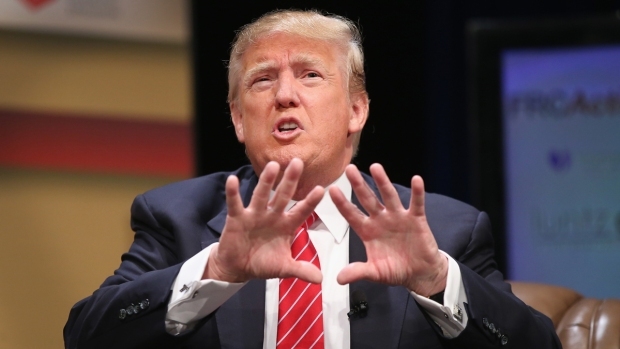 Does Donald Trump know what's best for his campaign, or is he dragging down the GOP? Supporter Ernie Boch Jr., CEO of Boch Enterprises, discusses the Republican nominee.